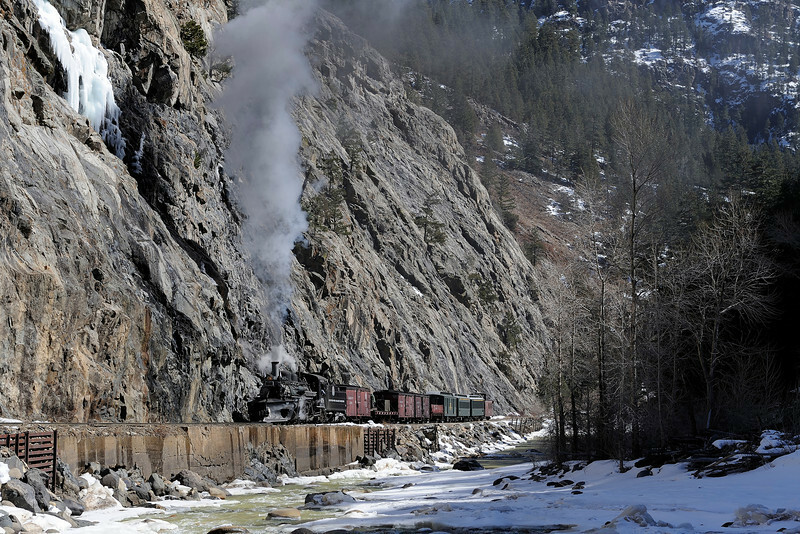 The Denver & Rio Grande Railway began construction on the line from Durango to Silverton in the fall of 1881 and completed work in July 1882 when they began hauling passengers and freight. The famous "Highline" was blasted from the side of the canyon during the winter of 1881-1882 at a cost of $100,000 per mile. The line prospered until the price of silver dropped from $1.05/oz to $0.63/oz in 1893 and 10 large mines in the Silverton District closed. From then until the 1940's, the railroad struggled and by 1947, the Silverton Branch was in danger of being abandoned. Fortunately, Hollywood discovered Durango and several movies including "Around the World in 80 Days" and "Butch Cassidy and the Sundance Kid," which led to increased tourist ridership and saved the line until Charles E. Bradshaw purchased the line from the D&RGW and transformed it into a flourishing tourist line. Today the line is owned by Allen and Carol Harper who continue to focus on the preservation of this American treasure.